Happy almost new year! Before I switch right into full on year reflection mode, I'd like to take a little time just to appreciate some highlights from this month, now that we're post-holiday madness. This month has been jam-packed with festive activities from start to finish. In the first week of the month I headed up to Omaha with John's family. We started with dinner at Modern Love, an amazing vegan restaurant by the awesome Isa Moskowitz. After stuffing our faces, we headed to see the annual production of A Christmas Carol at the community playhouse. I'd never been before, but I was thoroughly won over by the amazing sets, the humor they injected into the script and the acting. And if that wasn't enough, the play ended with fake snow falling on the audience and everyone was given a little loaf of bread! After all of that and seeing all the little kids dressed up in their nicest Christmas outfits, I was well in the Christmas spirit. The next weekend we got together with John's parents again and headed to the movie theater to watch a screening of the original version of Miracle on 34th Street. I'd only watched the 90s version with Matilda aka Mara Wilson before, and even though that one is really good, I think I prefer the original! There's just something about the old outfits and cars and designs that makes it feel a little bit more special. Getting to watch it in a recliner with chocolate covered raisins and a giant bag of popcorn doesn't hurt either. This year my sister and brother-in-law are going to be with his family in Mexico for Christmas (jealous), so we did a little Christmas celebration before the actual holiday and we'll do a little after they're back as well. To kick it off, we went to the winter edition of Love the Locals, a little handmade goods show. It's always super crowded, but it's fun to browse what kinds of goods, art, crafts and clothing people are making here. I didn't buy anything this year, but I took full advantage of the free toffee samples, thank you very much. Afterwards, we went back to my parents' house and started a cookie baking marathon. We tamed it down a bit from previous years, but we still made 4 different kinds of cookies: regular molasses cookies, a veganized version of the same molasses cookie recipe, peanut butter blossoms and double chocolate ginger cookies. We all went home with way more cookies than 2 people could want or should eat, but they disappeared way faster than I'd like to admit. I spent Christmas time with all kinds of family and friends. Christmas Eve we went to John's extended family's annual celebration dinner. Later, because my parents always play in the Christmas Eve service, we went to the service to watch them play (part of being in a musical family means lots of sitting in church pews alone while they gig). On Christmas morning we woke up, mowed down the cinnamon rolls my aunt always gives us for Christmas, opened our stockings and presents for ourselves and then went to John's family for the rest of the morning. They always go all out for Christmas, so we had more breakfast with them, did stockings and presents and then ate Christmas lunch and hung out for a little while. Then in the afternoon we went to see my parents and do presents with them followed by dinner (we cooked them a tasty vegan dilly stew with rosemary dumplings from Isa Moskowitz's Isa Does It cookbook). Lots of shuttling around, but totally worth it. Christmas isn't the only thing that happened this month even though those last few paragraphs might suggest otherwise. My grandma's 92nd birthday was this month and it's always great getting to spend time with her, especially since prior to the last few years she's always lived in another state. 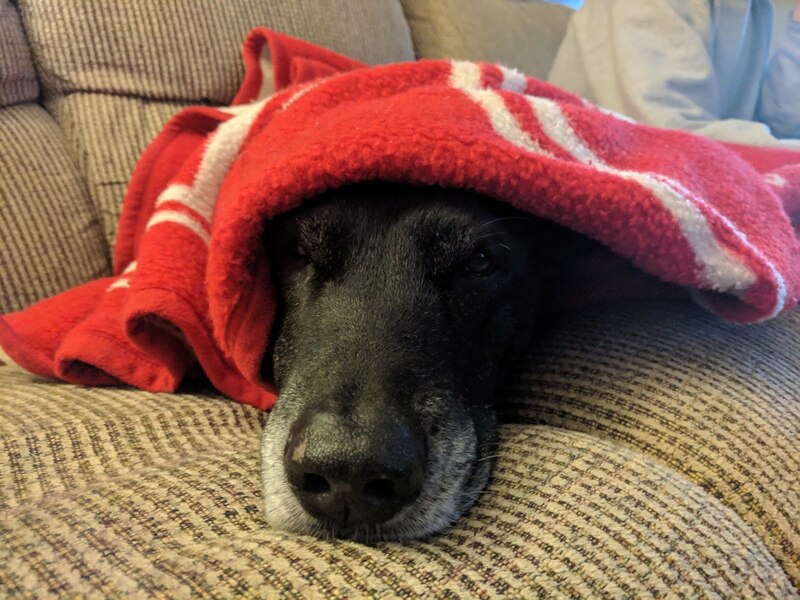 She might hate living where it's cold again, but I'm glad I get to see her as often as I do now, especially since she's getting up there in age and won't be around forever. This month was also the college volleyball playoffs and Nebraska made it all the way to the championship match! They ended up losing, but getting to see a team that wasn't expected to be championship material this year play their way up was really fun. It also helps cure the heartbreak of a less than stellar football season. 😅Finally, we went to see a movie with my parents as well, which never really happens, but it was really nice. We saw Pick of the Litter which follows a litter of puppies along their journey to becoming guide dogs for the blind. Me seeing two movies in a single month is pretty much unheard of but when one movie is a sentimental movie about animals, it's a little less surprising. I recommend seeing it if you want a feel-good film! This was a pretty great month to cap off a really amazing year. Now onto 2019! I always start a new bullet journal at the beginning of the year. 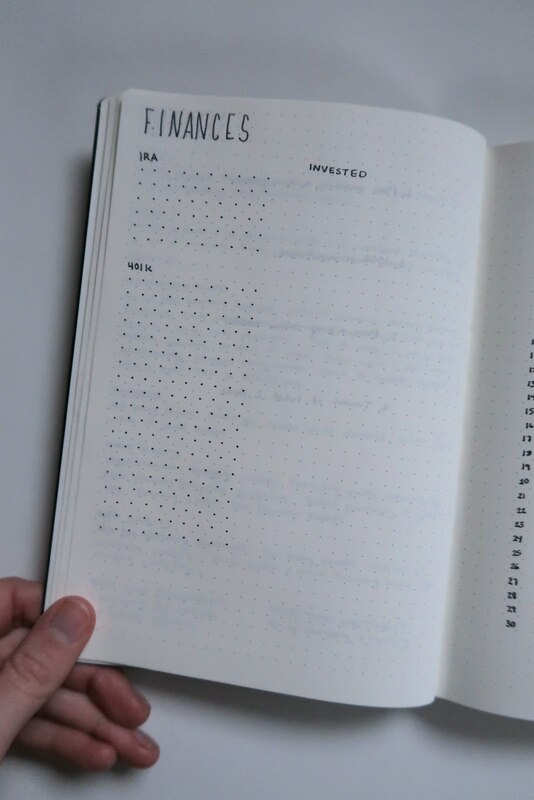 I have a few pages left in my current bullet journal, but it would only be enough for about a month and I like the fresh start anyway. That new bullet journal feel reminds me of the first day of school and I love it. I have always used the Leuchtturm1917 medium dotted journal, but I made the switch from softcover to hardcover a year ago and I'll never go back. So much sturdier when you're toting it around everywhere for a full year! 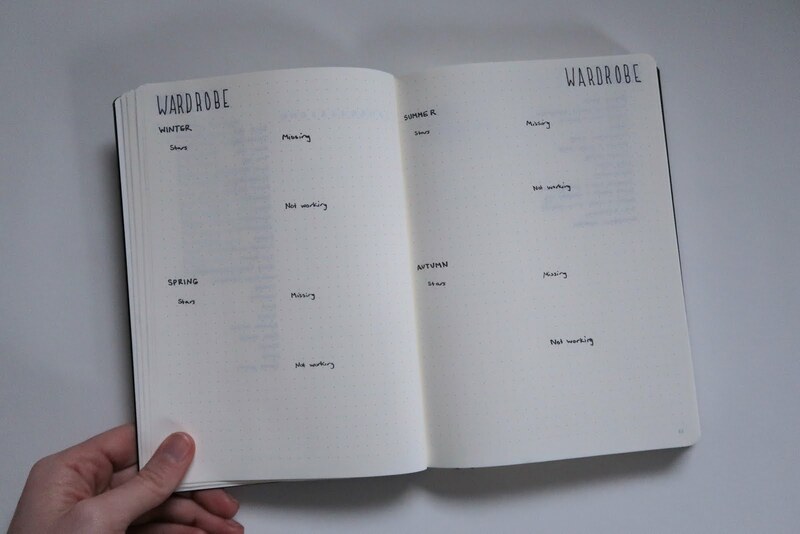 When I start a new bullet journal, I always add my future log in the first pages. 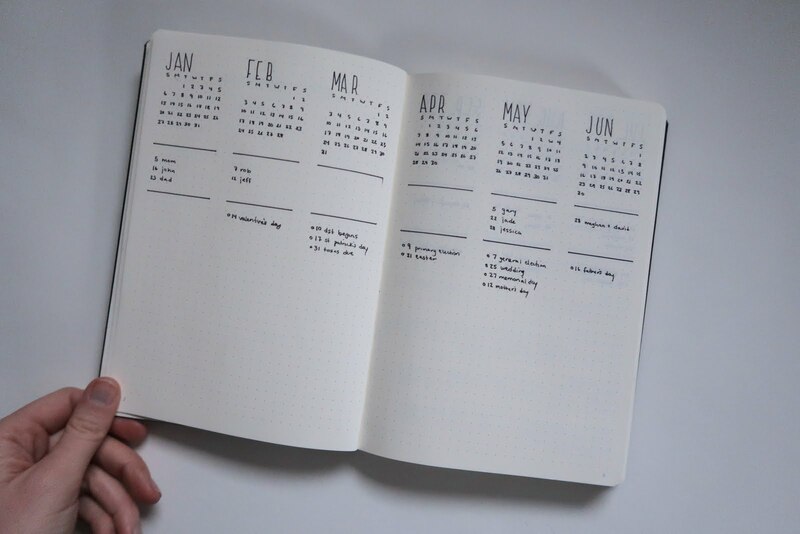 Three months per page, with a mini calendar at the top, birthdays and anniversaries next and important dates underneath that. I always add things like holidays, daylight savings time, election dates, weddings, meetings, etc right away so those are easiest to see in the list. Then I go back and fill in any smaller events or things I need to remember. After my yearly overview, I have a section for my review and goals. I transferred my 2018 review from my old bullet journal to my new one so I can look back at what I accomplished, what made me happy and what I best spent my time doing. 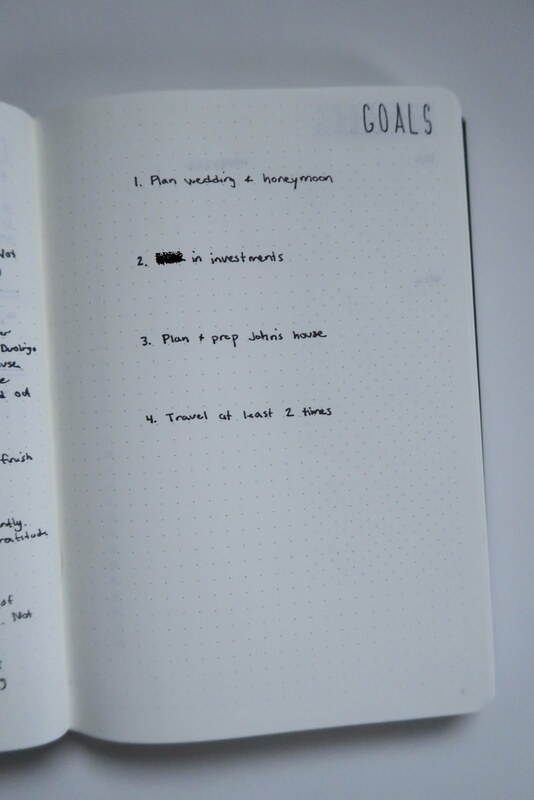 I've also listed out the goals I have for the year prominently on their own page, and then created two more pages for my financial goal tracking and my reading goal that I always set for myself. Even if I don't accomplish them all, I like to have something to aim for! Next up I have a bunch of collections that center mainly around my home life. My project list helps me keep track of all the stuff that needs to be done around my house. Hopefully I'll tick off more this year than last year... Opposite that, I have a cleaning log to help me remember what needs to be done and keep me more accountable for actually doing it! Then I have a space to reflect on my wardrobe throughout the year. I did this for the last two years and it's really helpful to identify pieces I wear a lot and might like more of or similar items, and to help identify items that just don't work for me. It's also really nice when the season comes around again to look back on last years reflection to figure out what I might need to buy or replace this year. 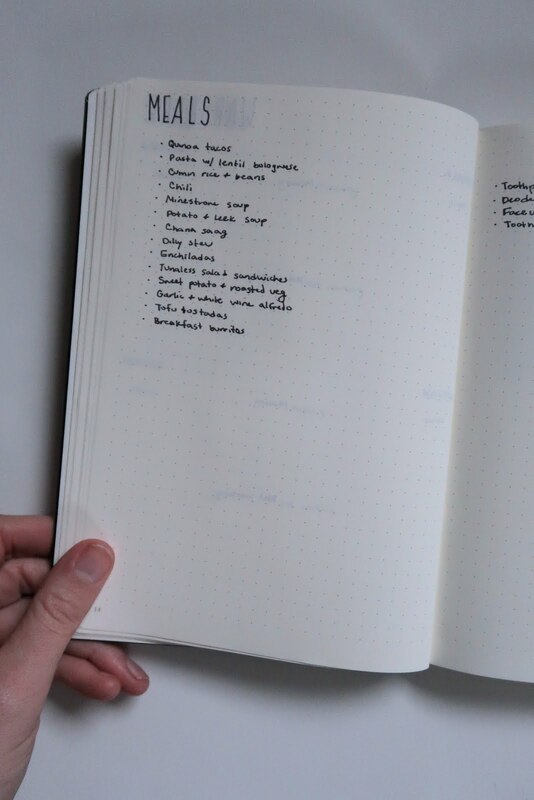 I also keep a list of go-to meals at the front of every bullet journal for a little help when I'm meal planning each week. It gets tiring trying to come up with new things each week, so it's nice to have some easy, dependable meals to fall back on when you can't be bothered to be creative. Last year I started a big transition in my life to living in a more low impact way. 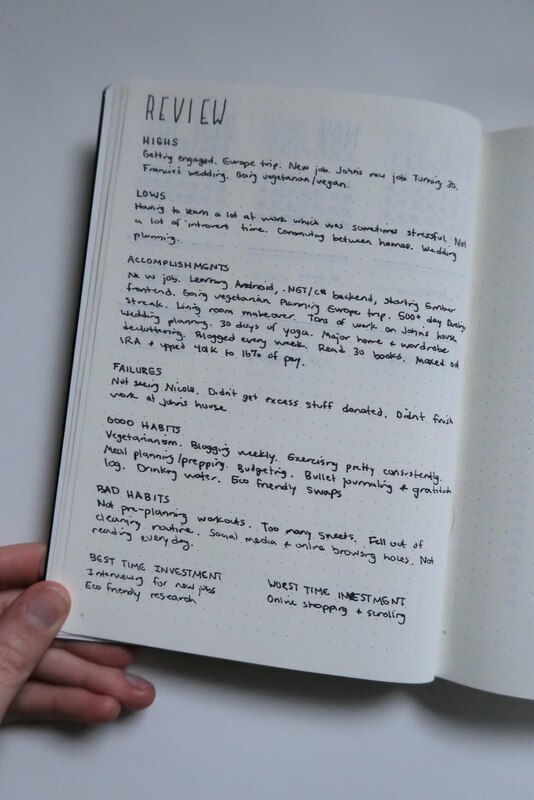 I'm a long way from perfect, so I decided I'll keep a list of things I notice in my life that aren't very low waste or eco friendly so I can come up with a plan to replace them for better alternatives. My plan so far is to create myself a little timeline so I can gradually but steadily make progress in this area. 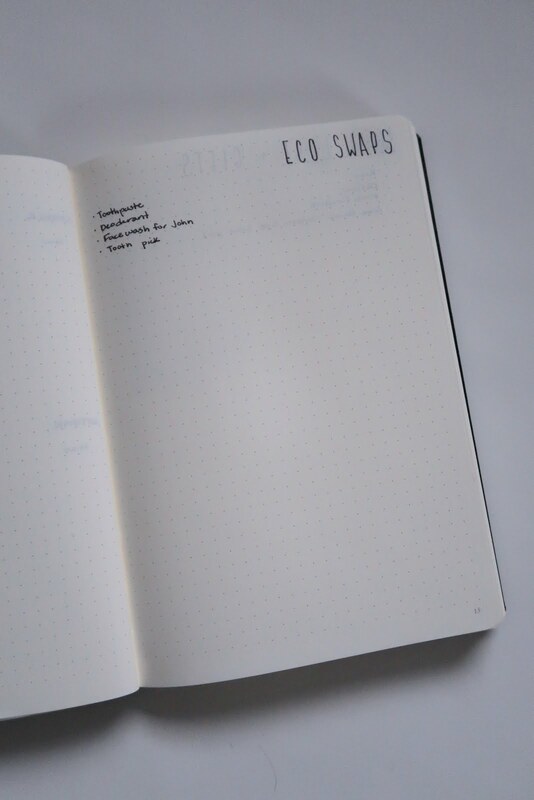 In kind of a 180 degree turn, next I have a single spread to keep track of things I want or need (I don't really want a vacuum cleaner, but I want one, you know?). Even though it's literally a list of things to get, my intention is that it makes me really think about the item I'm listing, consider it a bit first and only if I still think I need it will I buy it. In other words, try to keep those impulse purchases to a minimum! This page is also a place to jot down gift ideas throughout the year. 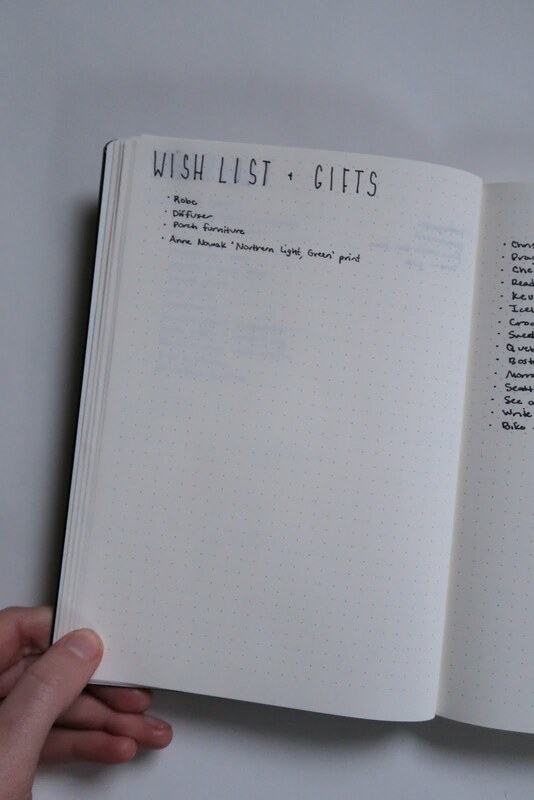 In this post-Christmas haze I always end up feeling like next year I need to be more proactive and better organized with gifts, so maybe this will help. Finally, I have a bucket list. Places I want to go, things I want to do, etc. This is my first year making one but it's already inspired me to me a bit more intentional with my free time. That's it for this year's annual collections! The next pages will be straight into January monthly pages, and I'm sticking to the same layouts I've had for the last 2 years. If it ain't broke, don't fix it and all. I hope you're having a lovely new year so far, and see you next time! I've been spending a lot of time lately reviewing my year and planning for next year and I'd like to share what all that entails for me in case one of you guys finds it helpful! What were your highs this year? What were your lows this year? What good habits did you have? What bad habits did you have? What was the best investment of your time this year? What was the worst investment of time this year? Once I had a good idea of how I felt about 2018, I turned to the future. To get my brain juices flowing about what I might want to focus on, I wrote down an aspirational vision of my future life. The goal isn't to make any measurable or realistic goals here. 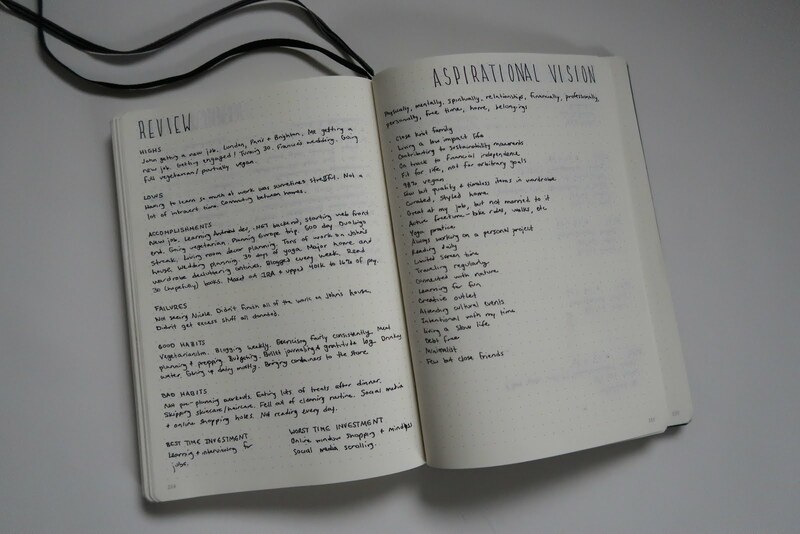 Instead you just write down what your perfect life would look like long in the future. What would make you happiest? Where would you be? Who would you be with? What would you do every day? What would you not be doing? Write down anything that's important to you, or that you wish you could be doing! 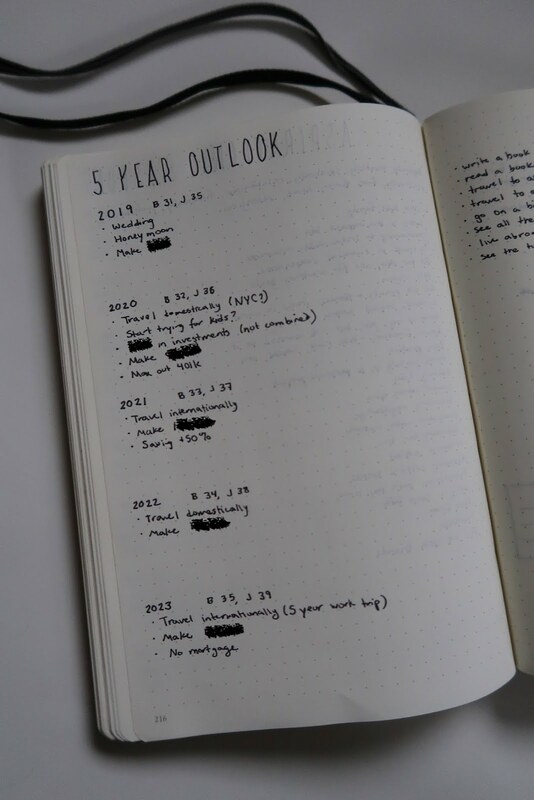 From the more reasonable 5 year time frame, I started brainstorming potential goals for this year. 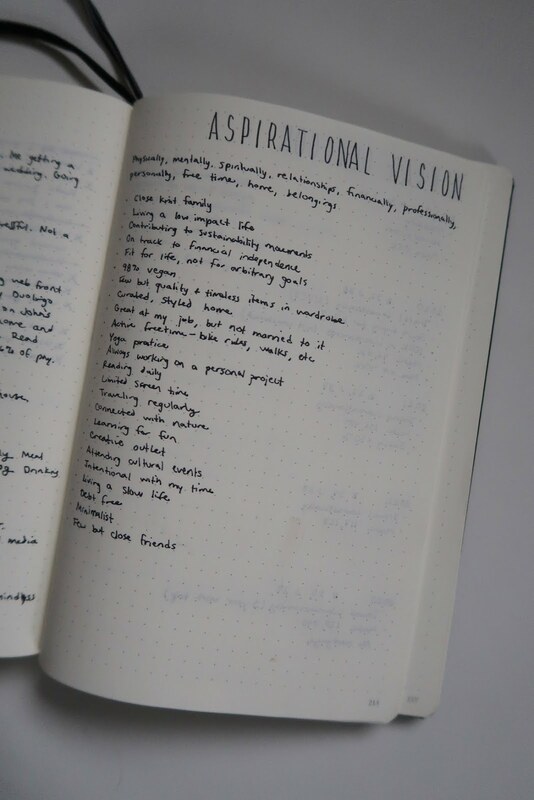 I wrote down ideas in all kinds of areas of my life and then whittled them down until I found 3 or 4 goals that seemed most important to me right now. Last year I had a goal for every area of my life and I found that it was just too much to manage, so this year I'm sticking to just a few so I hopefully be more effective. 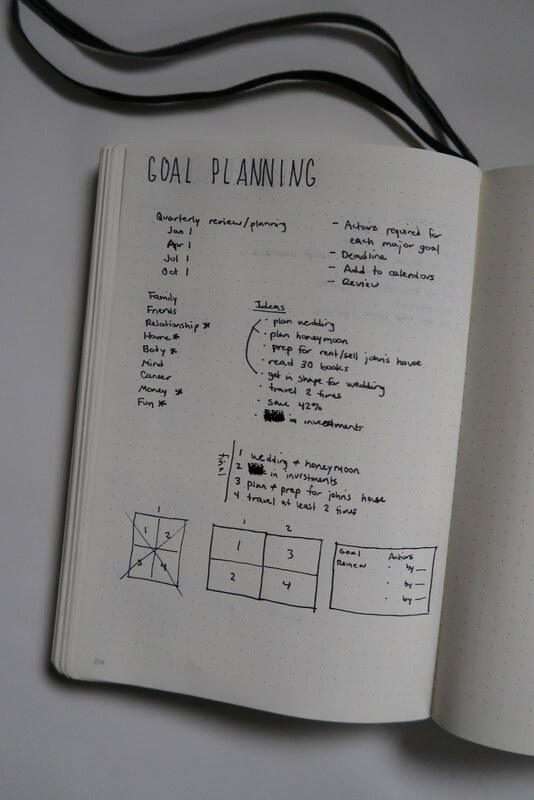 With my goals in place, I also spent some time brainstorming how I wanted to track my progress effectively. 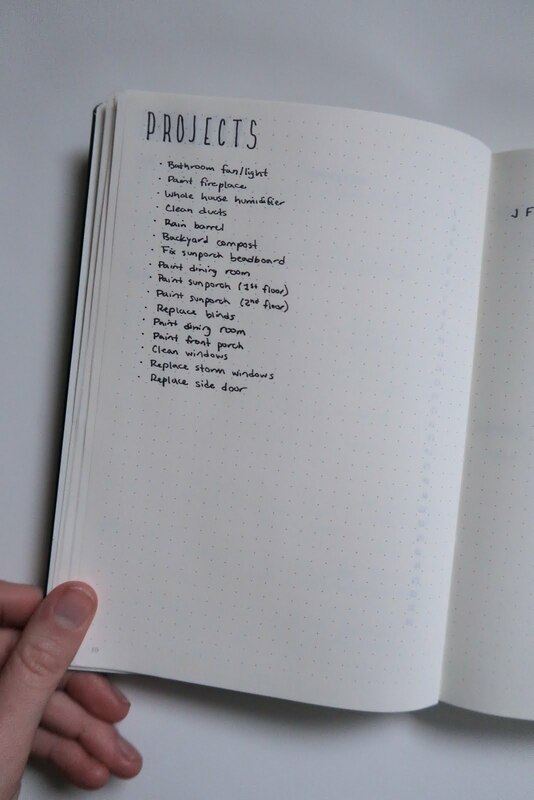 In last year's bullet journal I simply wrote my goals in bullet list format at the beginning of my notebook, but I kept forgetting about them and didn't really set aside any time to make actionable tasks to accomplish them. 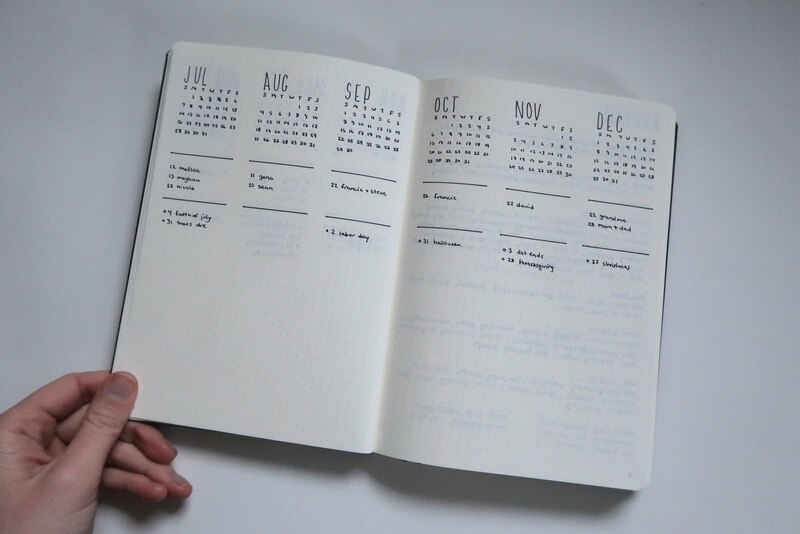 This year I'm going to add quarterly reviews to my calendar, and I'm going to devote a 2 page spread every quarter to reviewing my progress with each goal and creating some tasks with with due dates to complete before the next check-in. That should help me progress nicely! Finally, I devoted a morning to reviewing some of my routines and tools for managing my day-to-day life. To help me budget on a weekly, monthly, and long term basis, I have a big spreadsheet with a bunch of different sheets. I closed out my weekly spending tracker sheet for 2018 and created a new 2019 sheet. I refreshed my net worth tracker layout so that I can better differentiate between investments, cash, assets and debt and track the change between each month. I even created a new sheet to try out this year to track the dollars in, the dollars out, the dollars that get invested, and then ultimately calculate what percent my saving rate is. With all my money sorted out, I turned to my home. 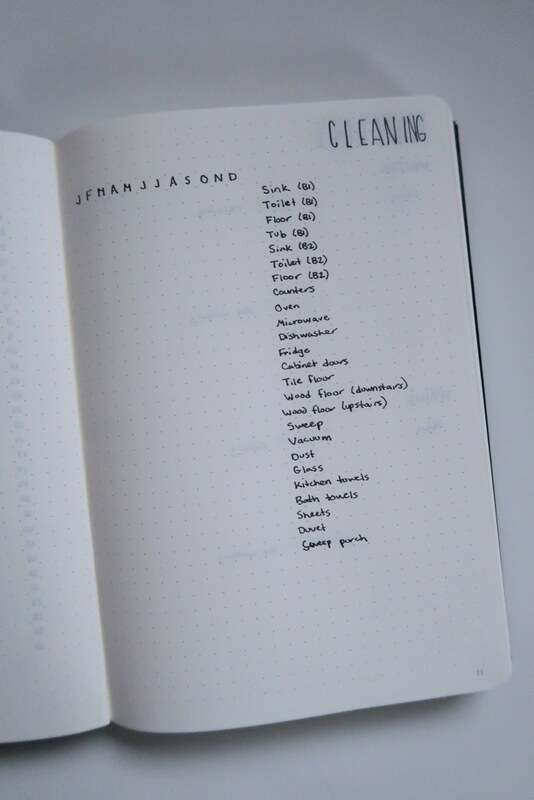 I reviewed last year's list of chores to make sure they were all still needed and to add any new ones, and then revised my cleaning routine around those changes. 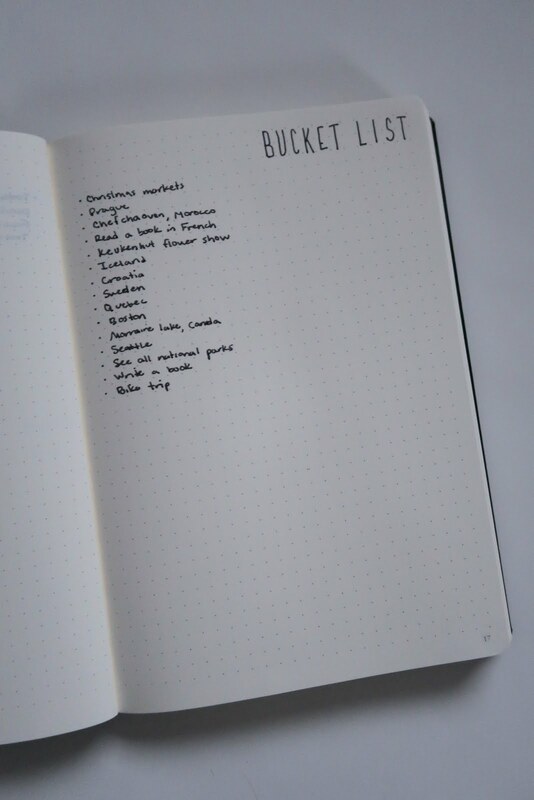 I also updated my list of house projects that need to be done and my wish list of items I need to buy or replace around the house. I hope this helps motivate you to do a little refresh and planning session of your own! 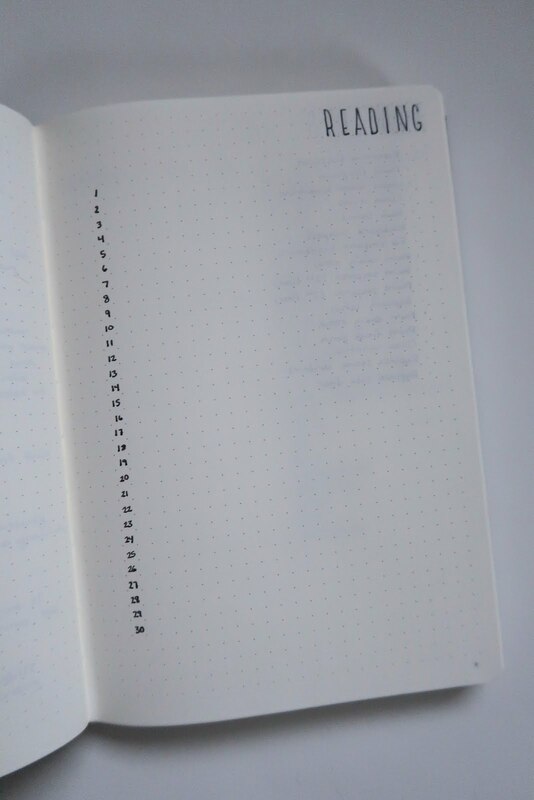 Having done it myself, I've got a good idea where I stand and what my goals are and I'm ready to start setting up my new bullet journal for 2019. Keep an eye out for a tour, coming soon! In the meantime, happy new year! Waking up on Christmas morning, all warm and cozy under a heavy winter duvet, my own subconscious rather than the usual alarm prodding me to stir, telling me there's something special about today I need to wake up for is one of those feelings I wish I could bottle up and dip into at my leisure throughout the rest of the year. It's a potent little mixture of youthful anticipation, familial love and togetherness, and the serene sense of this being a day meant for simply being, not the usual monotonous hum of responsibilities and routines. But sadly Christmas is only one day. 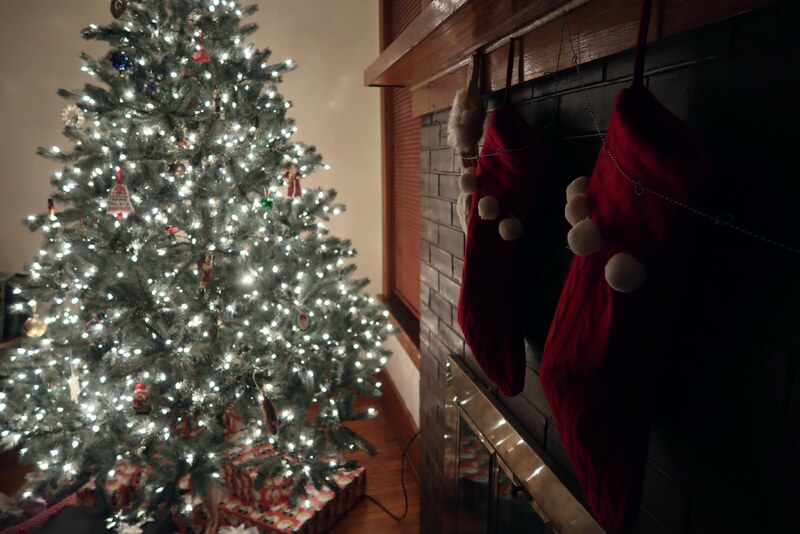 Maybe we can't sit in that Christmas morning moment forever, but we can certainly anticipate it, celebrate it and attempt to conjure up some of the same feelings in the days leading up to it! 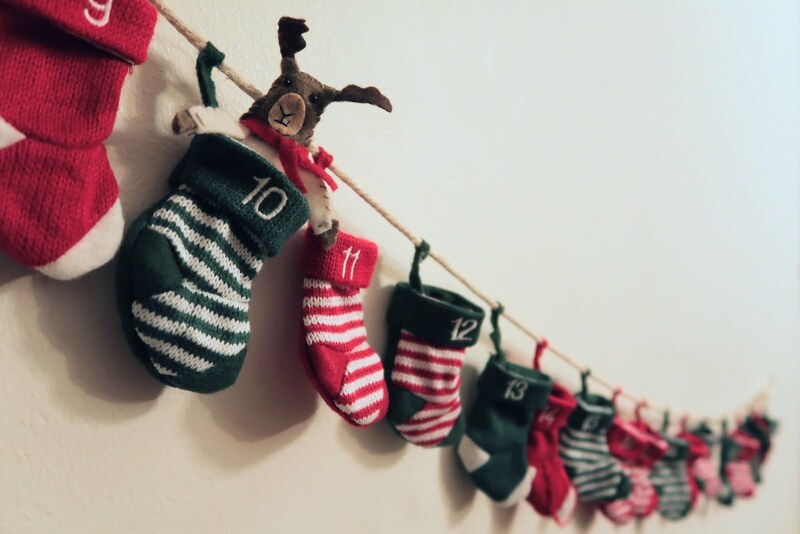 In my house, we start counting down to Christmas the second Thanksgiving is over. Cheesy Hallmark Christmas movies are on almost every night, and Christmas songs play on the stereo as we're cooking and are whistled and hummed as we go about our days. 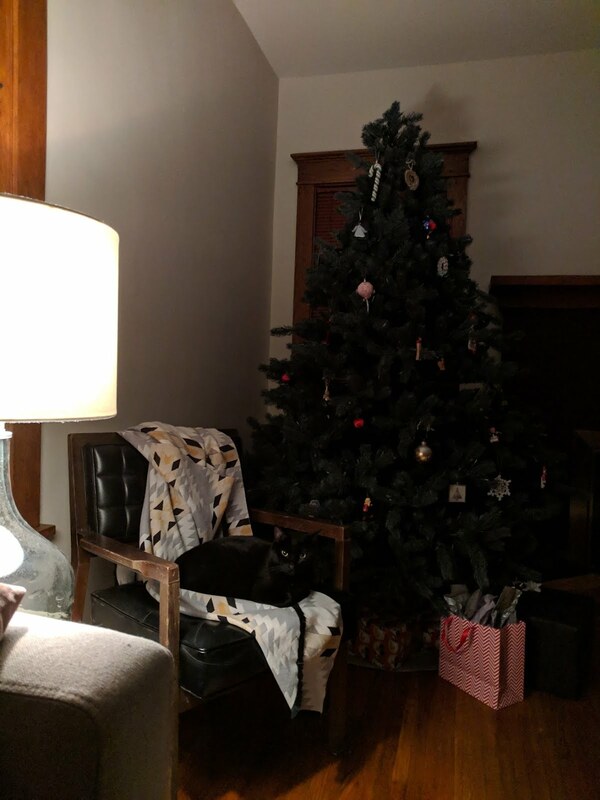 We decorate a huge old Christmas tree with ornaments passed down to me from my parents, hang stockings on the mantle and a wreath in the entryway. 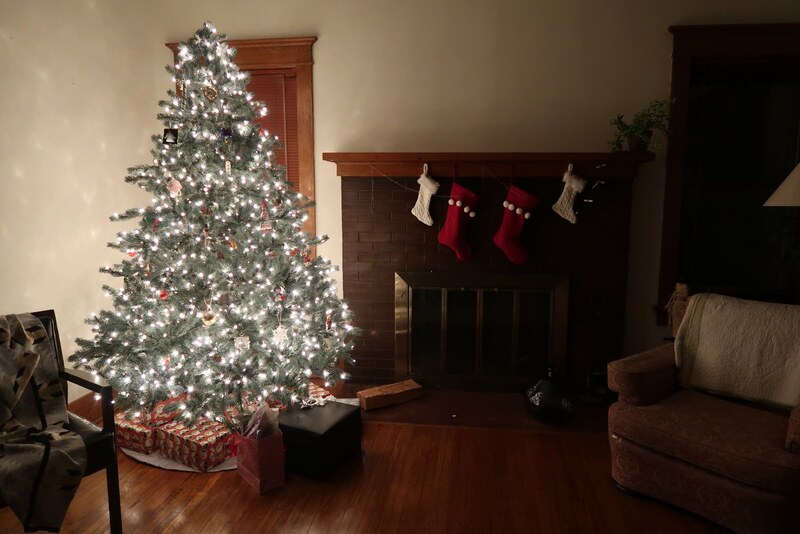 Our house greets us every night as we come home from work with cheery, warm lines of lights around the roof and twirls of lights around the porch columns that remind me of candy cane stripes. 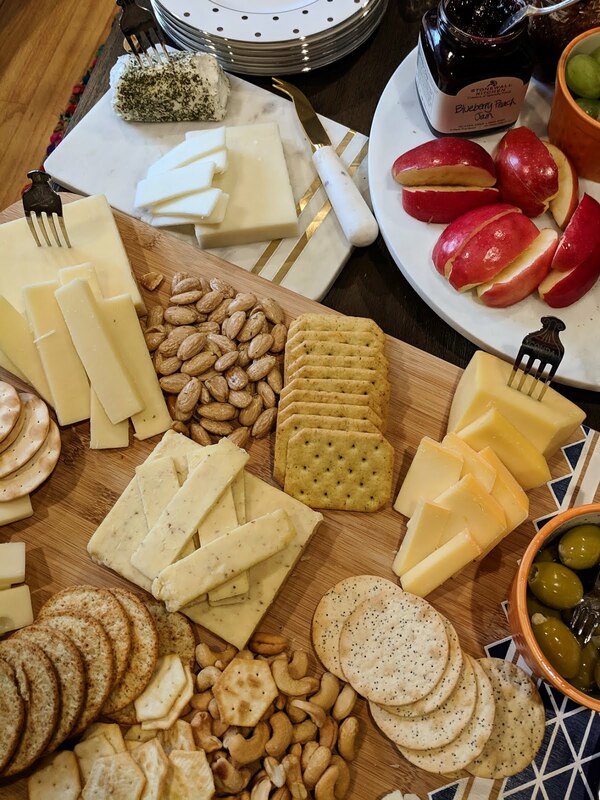 We eat our way through heaps of John's mom's Christmas treats -- the same kinds each year, which gives us that nice sense of familiarity and comfort. Just in case we were short on sugary foods, my family spends an afternoon baking all our favorite Christmas cookies so we have plenty to swap and take home to enjoy throughout the month. And this year we close every day reading a little message from the personal advent calendar I made. All these things we spread throughout the month do wonders for elongating those fleeting magical hours of Christmas morning. 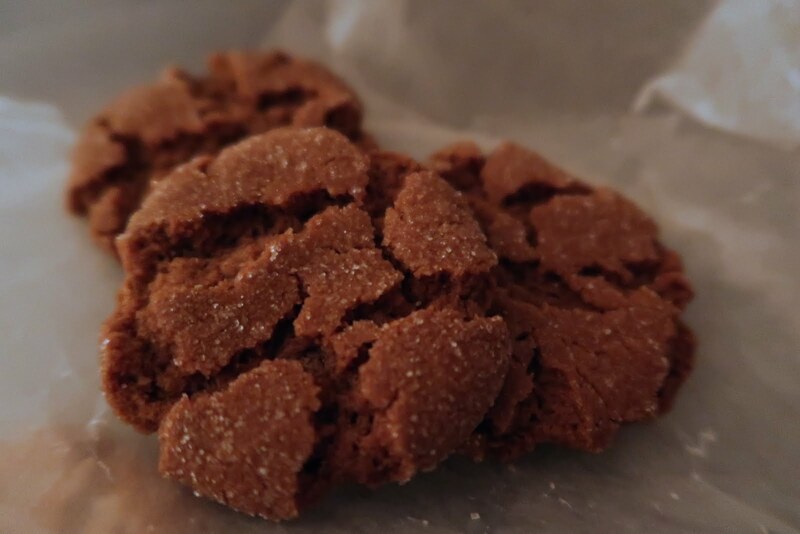 In case you're in need of your own festive feelings, here's my favorite holiday cookie recipe. 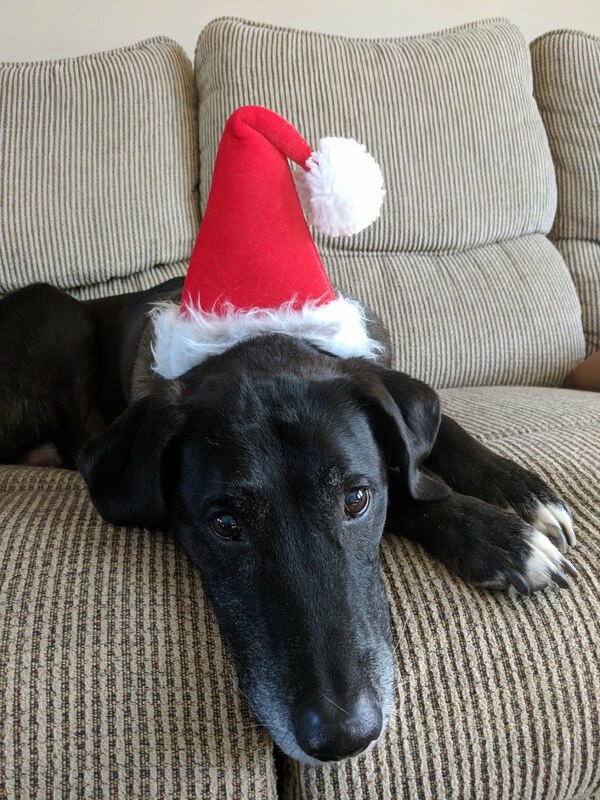 I hope it brings you a little joy! 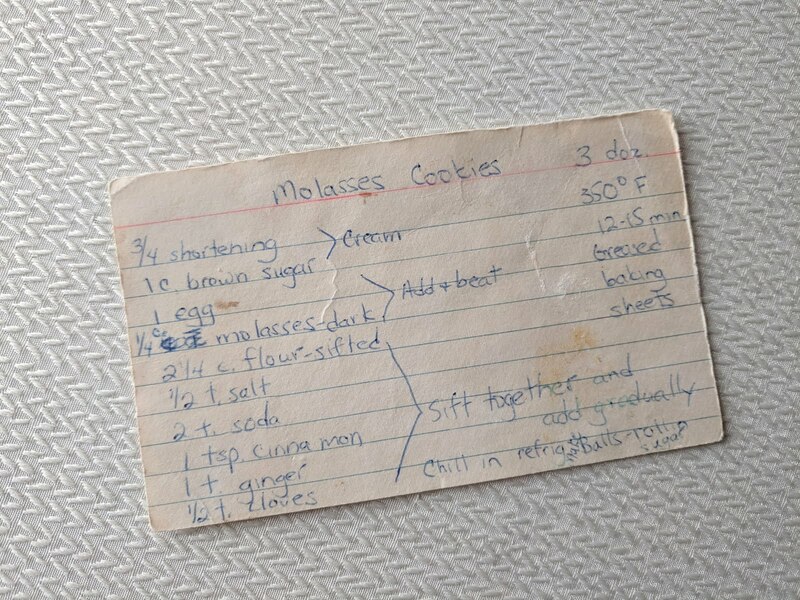 My mom's recipe card, copied from her mom's recipe card. 2. Cream together shortening and brown sugar. 3. Add egg and molasses and beat. 4. Sift together the flour, salt, baking soda, cinnamon, ginger and cloves in a mixing bowl. 5. Gradually add dry ingredients into wet ingredients. 6. Chill dough in refrigerator for about 20 minutes. 7. Roll dough into 1" balls and then roll each ball in white sugar to coat. Place on greased cookie sheets. 8. Bake for 12-15 minutes, let cool and enjoy! 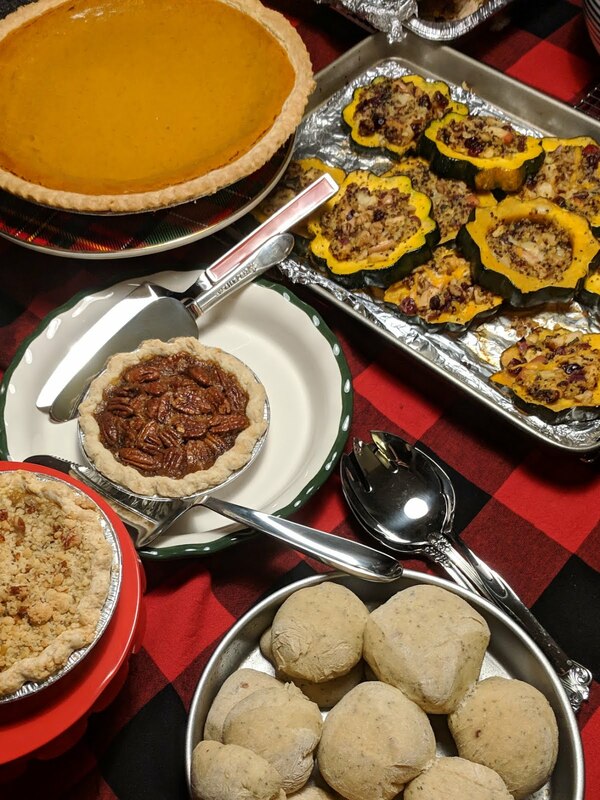 In my November highlights, I mentioned my Friendsgiving meal which was my first completely vegetarian Thanksgiving meal. It was super tasty and I think the menu would work really well for any other winter holiday, so I thought I'd share it with you all! All credit goes to my friend for coming up with this menu and executing it so well. Pies galore. We ordered several small pies from a local bakery! Wine -- three chardonnays, a cabernet sauvignon and a shiraz. Spiked apple cider -- a few bottles of apple cider, some mulling spices and a bottle of vodka. We cooked this over the course of an afternoon together. Having so many munchies and drinks on hand made for a really enjoyable cooking time. 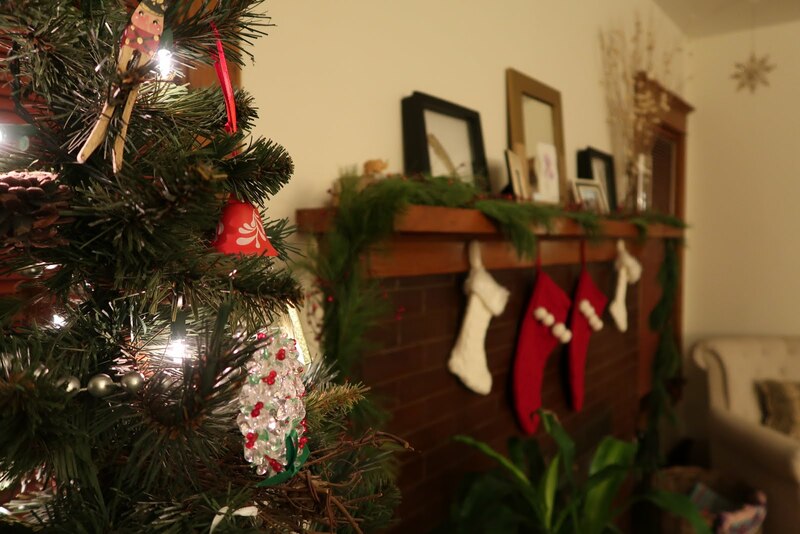 Throw on some festive music and you've got yourself a very cozy, fun gathering. We're smack dab in the thick of gift giving time once again. It's a fantastic time of year for many reasons, but sometimes you might just feel like giving but without all the stuff. Maybe you're short on money this year, maybe you're actively trying to be a bit more minimal, or maybe you just can't be bothered to fight your way through stores or try to be around for all those package deliveries. Whatever the reason, I thought I'd put together a bit of a gift guide with less of focus on material goods. There's still a few physical things in here, but I hope they're a little more purposeful or thoughtful while bringing delight. Instead of advent calendars that center around small gifts or candies, this year I'm making a personal advent calendar for John. I wrote down 25 things I love about him, rolled them all up and taped them with Christmas themed washi tape I had leftover from past bullet journal spreads and tied them all up into a string I can hang on the mantle. Each day he'll get something hopefully makes him feel loved, appreciated and special even though he's not getting something physical. So it's not actually something that goes directly the the recipient, but it's definitely something that could make them happy as long as you do a little research on what causes are close to their heart. For instance, if someone was donating something in my name, I would be very happy if money went toward anything that helps prevent climate change in any way. If I was giving to my parents, I'd give money to a local music group like the Nebraska Jazz Orchestra, a group my dad has played in since it's inception. 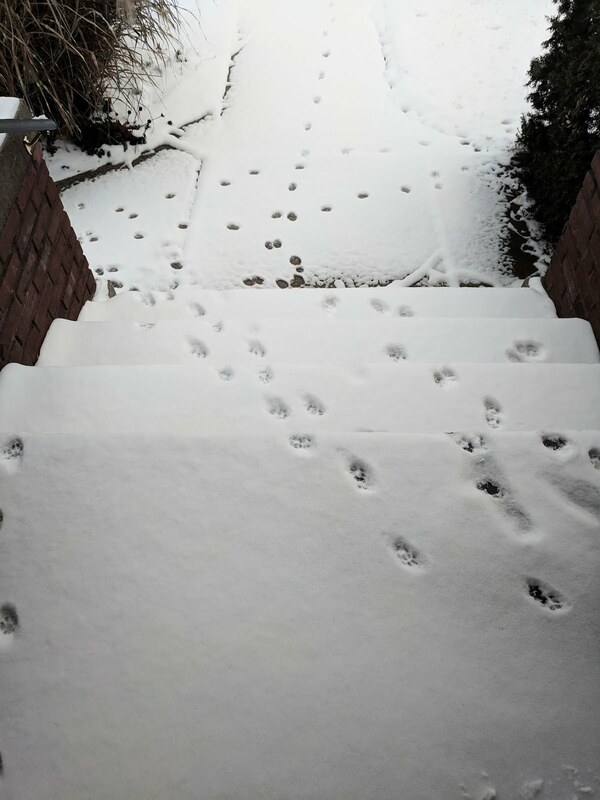 For my cat loving sister, I'd give to the local no-kill cat shelter. If you're not sure what causes your recipient is passionate about, try asking them where they've volunteer if they had all the time in the world! If you can't give a lot in terms of money, try giving your time instead. A lot of times I just wish I could spend more fun afternoons with my family and friends, but it's sometimes hard to come up with a plan the day of. I would love is someone planned out a day with things like an easy hike or bike ride in a park with a picnic, a museum visit followed by some local window shopping, or a day trip to a nearby town because it would me that not only would I get to spend time with them, but I also wouldn't have the added pressure of doing the planning myself. Another way to give your time, and probably my favorite gift I could receive in this list, is volunteering to do someone else's dirty work. What have they been putting off for a long time, or what do they absolutely hate doing but have to do anyway? I hate folding laundry. If John promised to fold my laundry for a full month I might cry with happiness. Maybe it's something like doing someone's grocery shopping for them when they're busy, meal prepping for them for a week or two, helping them deep clean their closets/garage/bedroom/etc, or doing all the emotional groundwork on project like learning about what size of bathroom exhaust fan you need to buy (not that I've been needing to do that for a few years now or anything...). Anything that takes a little stress out of someone's day to day life is perfect! Sometimes you still just want to give somebody something material. Go for it! My only advice? Make sure you're giving in a conscious way. I once heard a little saying to help focus gift giving that I still think is a great idea to this day -- buy something they want, something they need, something they'll wear and something they'll read. Obviously you don't need to get someone a gift in every one of those categories, but it's a nice place to start brainstorming from. Just try to stick to things that the recipient truly wants and doesn't already have something similar to so you can be sure it doesn't go to waste. And finally, if you're really stumped, I love the idea of gifting a plant! 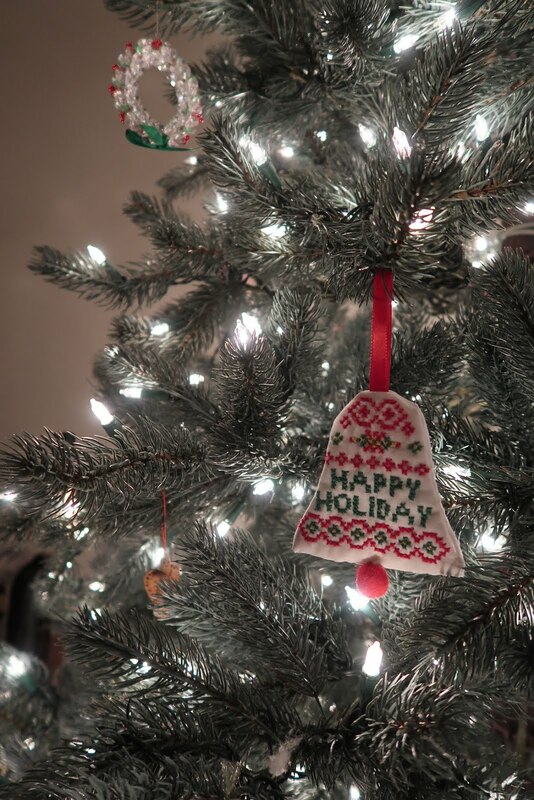 Hopefully this little list has given you some ideas for the holidays this year. Happy gift giving! And so it begins -- the most wonderful time of the year! Cheesy? Maybe. Accurate? Absolutely. Of course I can only say this openly now that's it's officially December, but truthfully our household started hitting the Christmas movies and songs hard starting November 1st. Some say that slights poor little Thanksgiving, but I beg to differ. For us, Christmas isn't religious (*insert gasps here*) and Thanksgiving just doesn't have it's own bad Hallmark movies or traditional songs (minus Alice's Restaurant by Arlo Guthrie, of course). I love Thanksgiving just as much, but until it steps up it's celebration game, Christmas songs will just have to fill in for both. 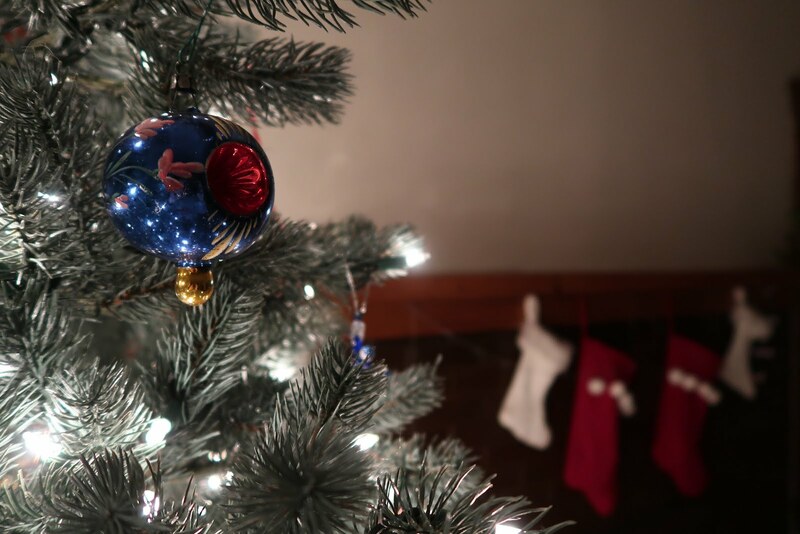 On that slightly ramble-y note, here's a look at my highlights from the month I call the official start of the holiday season. 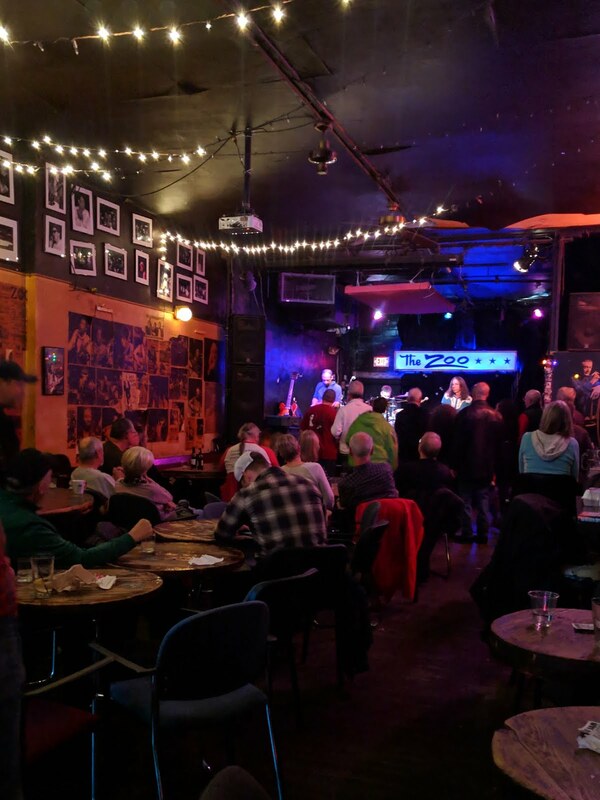 November kicked off with a bit of an unusual family tradition of sorts: seeing The Bruce Katz Band at the Zoo Bar. Every time they announce they're coming to town again I brace myself for an email from my dad arranging for us to get ticket. My uncle also loves them, though they rarely seem to venture up to Chicago where he lives, so my aunt and uncle used the show as an excuse to come down, see us family and enjoy a few beers at the dive-y-est of dive bars. The atmosphere at the Zoo Bar is always fantastic (you can practically feel the history seeping out of the walls -- or maybe that's just the aging wallpaper of old show posters), the show was amazing as per usual and seeing family is always special, especially when the whole night culminates with family dinner at a nearby Indian restaurant. The next weekend was decidedly quieter, but still quite enjoyable. On a few scattered Sundays throughout winter, one of the summer farmer's markets reforms inside for a special winter market. There's produce, some tasty baked goods and a few handmade items. Even if you don't need anything, it's fun to meander around and take a look at all that's on offer -- especially when there are free samples. John and I joined my sister and my brother-in-law for a little adventure. We hit the market, refueled with the most delicious vegan pecan roll I've ever eaten at Goldenrod Pastries and then did a little shopping at paper kite, a cute kids shop, and Home & Closet, a vintage furniture and clothing store where we found the most 90's Husker national championship sweatshirt, complete with a black and white gradient Husker logo and gaudy picture of the championship ring. Naturally my brother-in-law pulls it off like no one else could. Then the marathon began. Thanksgiving day we always go to John's cousin's house for lunch with all of his (very large) extended family. 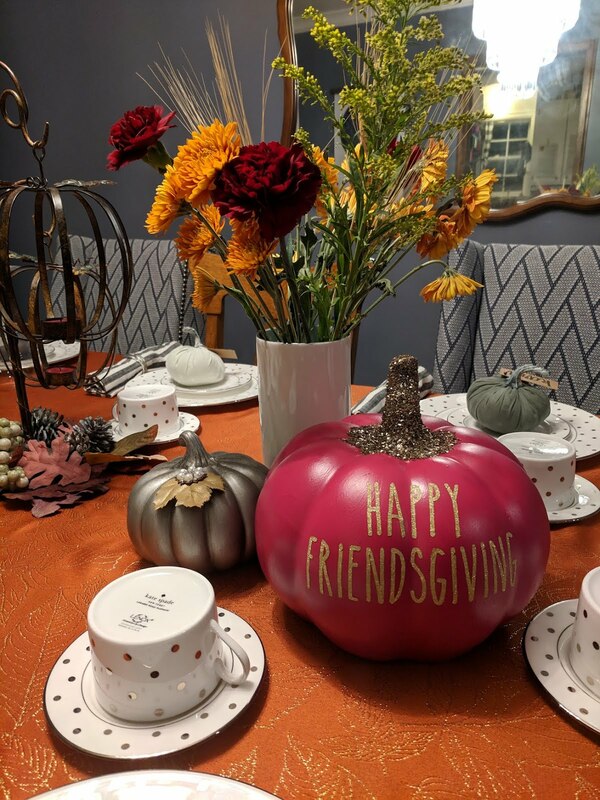 Then, because my brother-in-law's birthday happened to fall on Thanksgiving this year, we headed over to my parents' house for birthday dinner with my family and another aunt, uncle and two cousins and their respective significant others. The next day kicked off with an 11am football game (we lost 😢) and then my family's Thanksgiving meal which we capped off with a 7pm volleyball game (we swept them 🎉). Saturday we had a slow morning of reading and putting up Christmas decorations and then we headed to Omaha for Friendsgiving. This was the first year I didn't host Friendsgiving at my house and it was also my first ever fully vegetarian Thanksgiving meal. It was great! I'll have to share the full menu in another post here soon because it could easily work for any other holiday. Finally, on Sunday we woke up to a blizzard warning, but that didn't stop us from making our fourth Thanksgiving meal, this time with John's immediate family. All in all, I had nine different kinds of pie, saw many people I love and thoroughly enjoyed four days off of work.